Don’t let your busy schedule cause you to run out of Soft Water! A water conditioner without salt cannot turn hard water into soft water. The effects of hard water entering your water heater can last for weeks resulting in staining of laundry, washing machines, sinks and tubs. Sign up for Hawkins Water Tech Salt Delivery Service and your salt will be delivered right to your home or business. Our automated calendar system tracks the necessary delivery interval based upon your conditioner’s make and model. When service is due, one of our salt delivery technicians will not only deliver the salt product you desire; they will fill your brine tank to the appropriate level and visually inspect your conditioner to review settings and check for any unusual wear. And, if your water usage increases due to returning college students or holiday visitors, don’t worry about running low before your scheduled delivery – just give us a call and we’ll make a custom delivery within a few days. Dependable— You can count on Hawkins to deliver salt on a consistent basis. Trusted— No one knows your equipment like we do. 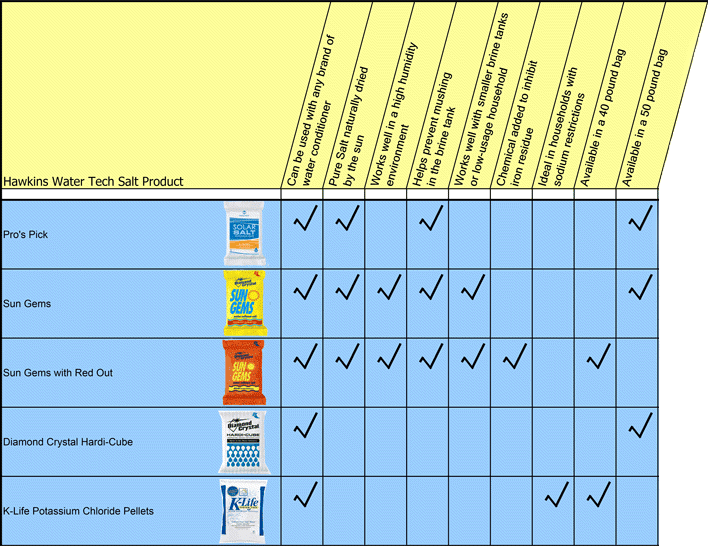 Hawkins Water Tech offers a variety of softener salt options so you can use the proper one for your needs. Click on the image below to see which product best meets your needs. Fill out the form or call us today to learn more.